Thursday 29 October - 8:15 p.m.
We are thrilled to welcome Mélissa Laveaux who will present her self-produced 2006 album, Camphor & Copper, which reveals an intricate blend of styles. 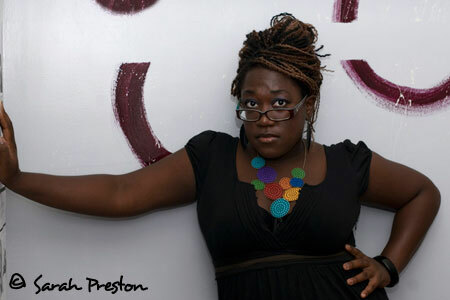 Canadian, with Haitian roots, at 23, already mature yet still fresh, Melissa exploded onto the song stage. Born in Montréal, where she was rocked as baby by a mother who loved Haitian jazz songs; she grew up in Ottawa (Ontario), where she was given her first guitar - a second-hand one - by her father, an amateur musician, when she was 13. Raised in a mostly English-speaking world, she never abandoned her first culture: Creole and French-speaking. So this album has a complex identity, blending her various influences with a combination of naivety and instinct. Practicing every day, Mélissa soon came up with her own personal, very rhythmic way of playing, and soon started writing her first lyrics and composing her first songs. From there, her resolutely contemporary songwriting soon went down a path of intimacy and confidences... The adventure of an absolutely free voice. The minimalist arrangements focus on the energy and poetic impact of her words. Her voice unfolds over everything, majestic and fragile, profound, sensual and deliciously juvenile, echoing with inner turmoil under the obviously seductive façade, woven through with the trilingualism that has marked her life story: the fluid rhythms of the English language, nonchalant syncopations of Creole, and harmonic sophistication of French. With an album like this, Mélissa Laveaux is sure to make a striking entrance into the circle of the most promising singer-songwriters of her generation.